What better way to celebrate a 35th vintage than by thanking to the community with a series of random acts of kindness? I was thrilled to be a part of Sumac Ridge Estate Winery day of good deeds along with Rebecca Bollwitt (miss604.com) and Bob Kronbauer (vancouverisawesome.com). We each picked a charity or non-profit and surprised them with a donation. My non-profit of choice was Inner City Farms whose passionate members are raising awareness about the important of eating locally. With his team, head farmer Camil Dumont revives neglected garden spaces, converting lawns into sustainable, urban, organic farms. This brings us closer to our food and teaches us how to live more sustainably. 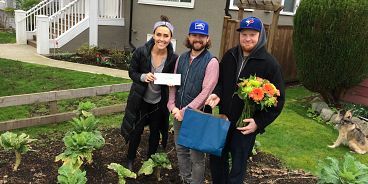 With 2014 being the hottest year on record, I am hoping this donation can help Inner City Farms do even more good in our community and inspire others to jump on this bandwagon. Learn more about them here. In 2015, will celebrate the winery’s 35th vintage and the Sumac Ridge team wants to show its support and appreciation for its community and loyal customers over the years. The winery has launched a year-long do-good, feel-good campaign open to all British Columbians who have enjoyed their wines. Named “Pay it Forward”, the idea is a simple one – do something nice for someone who has made you feel special or is making a positive impact in the community. Starting in March 2015, Sumac Ridge will also select their own deserving recipient and share a warm thank you and special treat with one of their loyal supporters. From there, it’s a chain reaction. The March honoree will select April’s, the April recipient will select May, and on it goes for a full 12 months. Sumac Ridge will also recognize those doing good in the community by celebrating individuals nominated throughout the year on their Facebook page. British Columbians will be asked to tell the winery who deserves a “random act of kindness” and why. The winery will select 12 additional individuals to receive a “People’s Choice” giveaway in the third week of each month. As the oldest operating estate winery in British Columbia, Sumac Ridge has a lasting reputation for making approachable, delicious wines at a good price. Winemaker Jason James takes pride in crafting aromatic whites and mouthwatering reds, all of them perfect for celebrating everyday occasions. For more information, find us at www.sumacridge.com.